West Indies 5-155 (Chris Gayle 36, Darren Sammy 30*, Dwayne Smith 30, Tim Bresnan 2-51) beat England 7-152 (Jos Buttler 67, Alex Hales 40, Krishmar Santokie 4-21) by five wickets. The visitors scored 152 runs for the loss of seven wickets in 20 overs and the hosts thrashed 155 with five wickets in hand and seven balls remaining. 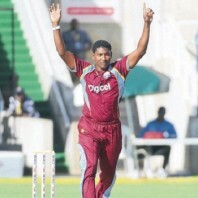 Krishmar Santokie (West Indies) was declared ‘Player of the match’ for his express bowling figures of 4-21. The second Twenty20 was played on Tuesday, March 11, 2014, at Kensington Oval, Bridgetown, Barbados. Earlier, the stand in captain of England, Eoin Morgan, won the toss and opted to bat but lost three quick wickets at 26 in five overs. Jos Buttler and Alex Hales started the consolidation process while the latter was dropped at 15 and 29 in the coming overs. 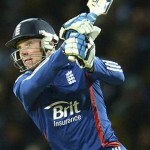 Buttler continued with his smooth knock and Hales was gone at 102 after scoring 40. The first attained his second fifty on the 33rd ball and was finally dismissed at 67 off just 43 balls with 3 lofty sixes and 5 fours as the tourists reached 7-152 after utilising 20 overs. Krishmar Santokie was the star performer with four wickets, Dwayne Bravo held two and Samuel Badree got one wicket. Dwayne Smith along with Chris Gayle provided a rising start to their team by smashing 48 runs in 4.3 overs with 5 towering sixes and 3 fours. Smith surrendered his wicket for 30, was replaced by Marlon Samuels and flow of runs was contained by the rival bowlers. Chris Gayle became the next victim at 75 for 36 and Samuels was the fourth batsman who went back to the pavilion at 116 for 28 whereas the Carribeans went down by another wicket at the same total. The home side required another 37 runs to win the game in 21 deliveries when Darren Sammy took over and demonstrated an attacking knock. He remained unbeaten for 30 off 9 mere balls with 3 sizzling sixes and 2 fours and took his team to 155 in 18.5 overs. Tim Bresnan was the top wicket taker with two whereas Jade Dernbach, Ravi Bopara and Luke Wright shared one wicket each. 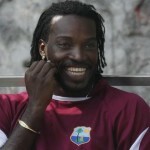 West Indies clinched the second T20 with a hefty margin of five wickets and leads the series at 2-1.